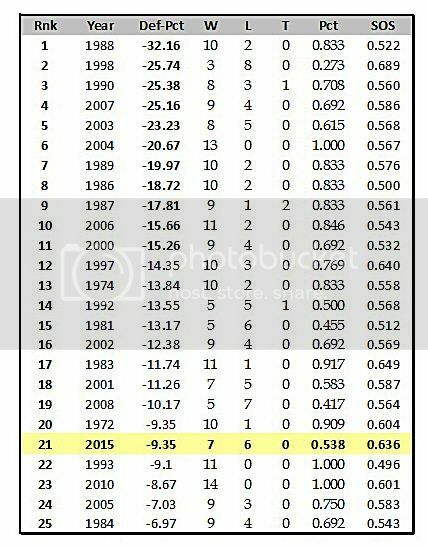 Here is the percentage of yardage Auburn's defense held their opponent to under their season average from 1970-2015. Not much of a surprise the 1988 defense was No. 1 on the list, holding their opponent to nearly 1/3 less than what they normally averaged. The 2015 defense finished at No. 21 on the list and the highest over the past 7-years. Combine the 2015 Auburn defense and the 2014 Auburn offense and you likely have another SEC title and a finish in the Final-Four. You cannot make a fair comparison of simply looking at the season averages, especially when you compare a defense from 2010 to 1988. This is why I like to compare the percentage of yards surrendered compared to what the opponent normally allows. There were fewer 400-yard offensive games during the 1980's compared to this current decade. During the 1992 season, 18 teams had a defense that surrendered less than 300-yards per game. This season there were only five. On the offensive side of the football there were 29 teams at the FBS level that averaged over 400-yards per game. During this past season there were 64 teams. In terms of improvement, during Auburn's first 6 games against FBS competition, the opponent gained 2.2% more yardage than they normally averaged. During the last 6 games of the season, Auburn held their opponent to -35.0% below their opponent's season average. Hopefully Kevin Steele's 2016 Auburn defense can pick up from where Muschamp's defense left off in 2015. Good stuff Stat. This confirms what most of us thought. The defense started out a little bit shaky but there was a culture change going on. It took time to solidify things. I think Steele can keep things going in the direction Muschamp started. If we had this year's D with 2014 offense, the Alabama game (2014) would have been a bloodbath.